Fall means crisp cool air, the first months of school, pumpkin spice lattes / pumpkin everything, and our beautiful BC foliage changing from shades of green to shades of red, yellow and orange. Your pet is probably welcoming the break from hot weather. But Fall is also a time of lurking dangers for our furry friends. A new season comes with new hazards that all pet owners should be aware of. 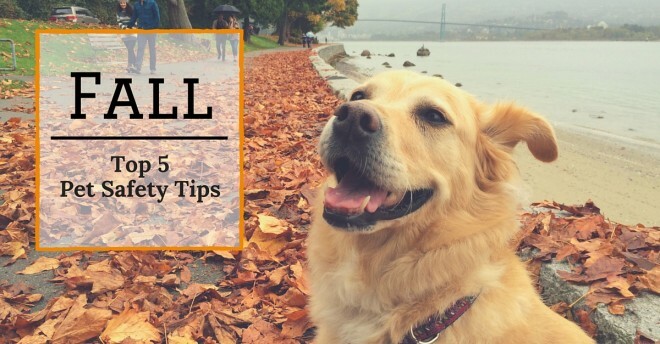 Here are our top 5 tips to keep your pet safe this season. Rodenticides: The use of rodenticides increases in the fall as rodents attempt to move indoors and seek shelter from the cooler temperatures. Rodenticides are highly toxic to pets, and could be fatal if ingested. If you must use these products, do so with extreme caution and put them in places inaccessible to your pets. If you think your pet has ingested a rodenticide, it is an emergency! Call us right away or visit an emergency clinic in your area. Mushrooms: You may have noticed more mushrooms in your yard and on your daily walks. Fall and spring and are mushroom seasons. While 99% of mushrooms have little to no toxicity, the 1% that are highly toxic are life-threatening to pets. Unfortunately toxic mushrooms are difficult to distinguish from the nontoxic ones, so the best way to prevent your pet from ingesting any mushrooms is to keep them away from mushroom ridden areas, and keep a close eye on them during walks. Thanksgiving and Halloween: It’s the beginning of the holiday season, which means guests in your home, more decorations that look like fun chew toys, and more delicious treats that may be harmful to your pets. Make sure your pet can’t escape through the main entrance of your home, and if they are wary of new people, make sure your guests are aware of this. Keep all decor and human food (baked goods, candy, and that Thanksgiving turkey!) out of paw’s reach. Fun fact: Trupanion sees a 71% increase in chocolate toxicity during Halloween compared to the previous six months of the year. Click here for more Halloween safety tips. Back to School: Back-to-school means supplies like glue sticks, pencils and magic markers may be popular items in your household, especially if you have young kids. These items are considered “low toxicity” to pets, which means they’re unlikely to cause serious problems unless large amounts are ingested. However, since GI upset and blockages are possible, be sure your children keep their school supplies out of paw’s reach. Be visible! : The beginning of fall means the end of long summer days, with the sun setting around 6pm instead of 9pm. When going for nightly walks, make sure you and your pet are visible. Wear reflective clothing and put reflective items such as vests and collars on your pet so motorists can see you both. Also put a light on your dog’s collar.